Fencing is one of only four sports to be included in every modern Olympic Games, since the first in 1896. 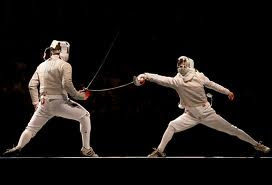 Fencing was also a sport in the original Olympic Games in ancient Greece. Baron Pierre de Coubertin, the father of the modern Olympic Games, was a fencer. The tip of the fencing weapon is the second fastest moving object in sport; the first is the marksman's bullet. Fencing is conducted on a 14m x 2m "strip" or "piste" to replicate combat in confined quarters such as a castle hallway. The end of the fencing strip represents the line drawn in the earth by duelists' seconds: to retreat behind this line during the duel indicated cowardice and loss of honor. The 750 gram weight test used to ensure a touch is scored with sufficient force is based on the amount of tension required to break the skin. In a duel, honor was done when blood was first drawn -- even if from a minor wound such as a blister. The target area in sabre, originally a cavalry weapon, is from the waist up because it is contrary to the rules of chivalry to injure an opponent's horse. There was originally no time limit on a fencing bout, until a Masters Championship bout in New York in the 1930s lasted for seven hours. Thereafter, bouts were limited to 30 minutes. Today, the time-limit has been reduced to just 3 minutes for 5-touch bouts and 9 minutes for 15 touches. Fencers wear white uniforms because before the advent of electronic scoring, touches were recorded on the white surface with a wad of ink-soaked cotton on the tips of the weapons. Famous Fencers: Bruce Dickinson, the lead singer of Iron maiden - foil. Neil Diamond, entertainer - sabre. Prince Albert of Monaco - sabre. Andrew Jackson fought a duel of honor with swords. General George Patton, competed in fencing in the 1912 Olympics and once owned a riding crop with a blade in the handle made by Georgio Santelli, New York fencing instructor and equipment manufacturer. Most recently, movie star Jerry O'Connell - saber. The New York Fencers Club, founded in 1883, is the oldest continuous running fencing club in the U.S. The first electronic scoring machine for fencing was invented in 1936 by Albert Skrobisch, an engineering student at Columbia and a future U.S. Olympian. In April 2003, Men's Saber Keeth Smart became the first United States Fencer to achieve a Number 1 World Ranking. He was quickly joined by Sada Jacobson, who claimed the Number 1 spot in Women's Saber, and still holds that spot going into the Athens Games. Mariel Zagunis (Beaverton, Ore.) is the first fencer in the world to hold four World Championships titles in one season: 2001 Cadet World Champion, 2001 Junior World Champion, 2001 Junior Team Champion, and 2000 Women's Sabre Team World Champion. Women's Foil was added to the events at the Olympic Games in 1924. Women's Epee was added in 1996. The 2004 Olympic Game in Athens, Greece will be the first time that Women's Sabre is an official part of the Olympic program. Fencers is not an elitist white male sport. College fencers are now 10% black, 9% Hispanic, 7% Asian, and 54% female. More Asian kids fence than participate in any other single sport in high school or college. Fencing is a life-long activity. In the 2012 Olympics, Valentina Vezzali of Italy was in contention to become the first woman to win four consecutive Gold medals in any Olympics – and she is 38 and a mother! Fencers are dedicated. US Fencing Association surveys show their members on average spend more than 5 hours a week and $240 a month on fencing. Fencing is growing. Over 60% of 20,000+ USFA members took up fencing in the past five years, 32% in the past two years! The number of junior fencers (under 19) has grown from 4,000 in 1998 to more than 12.5K in 2011. There are more than 20,000 competitive fencers registered with USA Fencing. About 3000 of them are in the NYC metro area. Current Olympians Nzignha Prescod and Race Imboden, and former Olympians Erin and Keeth Smartt, are all from Brooklyn. USA Fencing estimates that another 200,000 fence recreationally at colleges, high schools, health clubs, fencing clubs, and community centers nationwide. Fencing is one of only four sports that have been in every Olympics since 1896. Athens will mark the 20-year anniversary of the United States' last Olympic medal in fencing - Bronze won by Peter Westbrook in Men's Sabre. The tip of the fencing weapon is the second fastest moving object in sport after the marksman's bullet. It wasn't until 1898 that the 4 minutes timing limit has been invented.